Giant just revealed their newest e-MTB models for model year 2019—the Trance E+ and the Stance E+. We were the only American journalists invited to the exclusive launch of the bikes in northeastern Italy in the stunning Dolomites. These models are based on Giant’s standard Trance and Stance line of traditional mountain bikes, which makes their line more consistent. 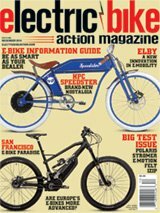 The bikes are called the Trance E+ and Stance E+, respectively. There are different levels of each, with the top of the line getting the 0 designation at the end. The Trance SX E+ 0 Pro is at the top, while the 1-, 2- and 3-level bikes have slightly lesser components and correspondingly lower price tags in descending order. Giant stepped up their game with the powerplants of their new bike. They use Yamaha motors re-branded as Giant SyncDrive, but designed their own battery to supply the juice. The battery is made up of 40 cells in a combination of series and parallel to maximize capacity of the battery and output voltage, and the cells are 2mm apart (most batteries have only 1mm between cells) to allow better thermal management and ensure cell longevity. The new charger for the proprietary battery is a 6A charger (most chargers output 4A max), and with its on-board diagnostics, it can check the battery life and balance of each cell. We could confidently point the Trance E+ anywhere and it would just go. Flowy trails like this were a blast. This smart charger will jam power into the battery as fast as it can on a new pack with healthy cells, allowing it to charge to 60 percent of the 500 Wh capacity in only 90 minutes and a full charge in about three hours. As the battery ages, especially after it has gone through over 500 charge cycles, the smart charger will slow down the charge to increase the life of the cells. The battery pack itself, called the EnergyPak, is built to fit into the downtube and become part of the structure of the bike. It releases through the bottom of the downtube using a key and a secured latch so it can’t just fall out. The bottom of the battery is a molded piece that matches the frame and serves as a protective cover for the battery itself. The Trance E+ features a coil-over shock mated with their Maestro link suspension. This setup is great for long rides where even a tuned air shock alone wouldn’t be able to provide consistent performance all the way down the mountain. The stock spring is 500 pounds, though heavier riders might want a heavier spring, which can be swapped out at the dealer. Rear travel is 140mm, and front travel with the beefy Fox 36 e-specific fork is 160mm. This bike is definitely aimed at serious enduro and trail riders, and with the higher-end components and suspension, it carries a price tag you’d expect, coming in somewhere in the neighborhood of $6–$7,000, depending on the country you’re buying it in. The Yamaha PW-X-built/Giant Sync Drive Pro-branded motor has custom power settings on five different modes each. Those modes don’t have a name, as they are merely indicated by LED lights on Giant’s new RideControl One display/control unit. This small unit, sitting next to the left grip on the bike, has two rows of five bright LED lights. The column on the right shows battery life in 20-percent increments. The column on the right shows drive mode—from off to level five. It turns on instantly and can be turned on on-the-fly (while you’re already riding). The power is delivered instantly as well. The torque sensor senses any input and can provide (depending on the power level) up to 360-percent support to the rider’s legs. We also found the off setting handy when stopping to talk, waiting for the rest of the group or just to rest because any pressure on the pedal makes the bike want to go. When we heard about this display in the presentation, we worried it would be too spartan. After all, we’re used to seeing speed indication, percentage of power or range remaining, cadence and more. In theory, geeking out on this info can be fun. In practice, though, we fell in love with the new display. Peripheral vision can be used for at-a-glance confirmation of battery remaining and power mode, then all that’s left is concentrating on enjoying the ride. This new controller has two rows of LEDs as the only display. It’s brilliantly designed, because it’s minimalist but works really well. The LEDs are bright and show you battery level and power level easily, even in bright sunlight. On a normal PW-X motor, the top-level version (called “EXPW” by Yamaha) bumps the power output to a neck-snapping 80 N/m of torque. This makes it unusable for most trail situations but the steepest of climbs. Giant seems to have figured out a way to make this far more livable with their software tweaks. By the way, in case you wondered if there was an app for riders to customize the power output and such even further, there isn’t. Not yet, but they’ve hinted that it is in the works. The PW-X—or Sync-Drive Pro, either way you call it—has one of the narrowest Q-factors out there, specifically enhanced by a specially designed Praxis crankset and steel front chainring with custom chainguide that keep it as narrow as possible. The drivetrain also features an e-specific SRAM Eagle chain, 12-speed SRAM cassette, SRAM XO derailleur and just beefy components throughout. How was the ride? In a word, sublime. The trails in Italy are rocky and technical on both climbs and descents, with plenty of tree roots and drops running down the trail. There are also some flowy downhill pump tracks with fast, tight berms. With simply setting what we’d consider normal sag on the suspension (about 30 percent), the Trance E+ rolled over every bump like it almost wasn’t there. It’s so good, it takes your confidence up a notch. They’ve worked out a really great suspension system that works incredibly well over any surface, and there was virtually no bump-steer over any rocks, roots, ruts or other objects we chose to roll over. It’s a very plush, supple ride that keeps the Minion tires planted on the ground and pointed where you want to go, even in slippery, dry dust. Tires are 27.5×2.6 inches, but the bike can handle up to 2.8-inch tires. The Shimano XTR Trail brakes with 200mm rotors stopped incredibly well, even on hour-long descents without a break. They never faded and were very easy to modulate. WHAT ABOUT THE STANCE E+? For more of the beginner or intermediate rider, there’s the Stance E+ line. Still based on a frame made with Giant’s proprietary ALUXX SL aluminum, it features a Flexpoint rear suspension with a 120mm of travel in the rear and a 130mm of travel in the front. The price is kept incredibly low by lowering the spec of the components. The drivetrain is all Shimano, with four-piston brakes, an 11-speed cassette, and a KMC e-specific chain. It still features Fox suspension but no coil in the back. It features the SyncDrive Sport motor, aka a Yamaha PW-series SE motor, identical to the previous PW motor but with a higher maximum cadence (120 rpm for those of you who love spinning). It uses the same RideControl One controller and proprietary battery, along with Giant’s own tweaks on performance. We rode this bike on similar trails as the day before. Where the Trance line are high-end bikes with almost no compromises, the Stance line is half the price but certainly not half the performance. There’s a lot of bang for your bike out of the Stance. It was sure-footed and fast through technical terrain, able to climb almost everything we threw at it and just plain fun! We rode in rain and mud on this day, and we can say that the weather-sealing on the bike held up perfectly.